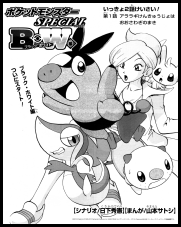 The cover for this volume is taken from the promotional artwork used on the official website. 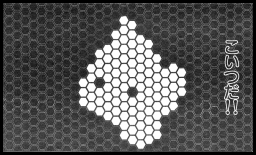 The black levels in the actual chapters themselves have been cranked way up for the English version. I don't know what happened when this volume went to print, but there are a lot of panels where detail is lost because the settings for the black ink were set way too high. Fortunately, Viz will get their act together in future volumes. Adventure 1 - "Fussing and Fighting"
In the Isshu region, a small town known as Kanoko Town is home to the laboratory of Araragi-Hakase. There, we see the young pokemon professor wrapping up a phone call concerning a group of trainers who are scheduled to come by in the morning to pick up their starter pokemon. The professor is about to put the pokemon - Tsutarja, Mijumaru, and Pokabu - back into their Monster Balls when the phone rings again. Pokabu spots some fruit left on a nearby table and decides to go for it. After knocking the entire plate off the table, Pokabu uses a flame attack to cook the food. Sparks from its attack burn Tsutarja, angering it. A fight breaks out and before long, all three pokemon are attacking each other. Araragi-Hakase, who had been talking to her friend Makomo-Hakase, hears the commotion and walks in to see that the pokemon have trashed her lab! In addition, it seems as if Pokabu has suddenly caught a cold! As Araragi-Hakase returns the pokemon to their Monster Balls and begins to clean up their mess, she wonders if the trainers who come and pick up these pokemon will be able to handle them. There are no significant differences between the Japanese version and the English version of this chapter. In Kanoko Town, a boy named Black and his two pokemon, Mun'na and Wargle, anxiously await the arrival of a package from Araragi-Hakase. When the postman finally delivers the parcel, Black eagerly rips it open and takes out the Monster Balls containing Tsutarja, Mijumaru, and Pokabu! Black, who had gotten sick from waiting outside in the rain the previous night, lets out a large sneeze that jolts the pokemon from their Monster Balls! The pokemon continue their bickering from before until Pokabu gets fed up and runs away! 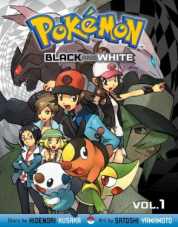 As Black chases after the Fire-type pokemon, his childhood friends Cheren and Bel come across the remaining pokemon. 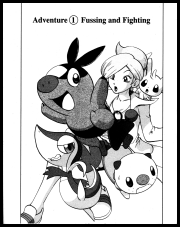 After choosing from the remaining starters, the two catch up with Black and witness him choosing Pokabu as his starter pokemon. A sudden attack from an unknown enemy startles Black, so his Mun'na hops on his head and uses its ability to eat dreams to clear its trainer's mind. With no other thoughts to distract him, Black is able to focus and determine that his attacker was a wild Kurumiru! After Black's Pokabu defeats the Grass-type in battle, Black and his pokemon hop onto his Wargle and fly off, ready to take on the Pokemon League. Black's Mun'na is nicknamed Musha (ムシャ) in the Japanese version. It retains its name in the English version. His Wargle is nicknamed War (ウォー) in the Japanese version. This gets changed to "Brav" in the English version. 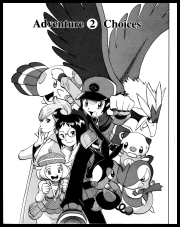 Page 26, Panel Four: Cheren's line "You promised to deliver these Pokémon to us today!" is a little more concise than the Japanese version. 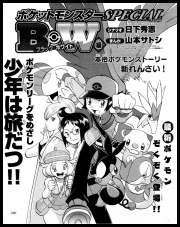 Originally, he says "This was the day when me and Bel and Black were supposed to get the three pokemon from you" (今日は博士からぼくとベルとブラックに３匹のポケモンがわたされる日。). Pages 34-35: There's a phrase in Japanese, atama no naka ga shiroku naru (頭の中が白くなる). The literal translation of this is "the inside of your head goes white," but we English speakers usually say something like "my mind goes blank" or "I've cleared my head" instead. 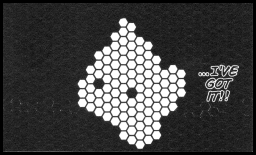 In this series, Black's head goes "white" (「白」) before turning "black" (「黒」). Since "the inside of your head goes white" sounds strange to us native speakers, Viz had to change this to "Musha helps him wipe his mind blank...totally blank...blank." 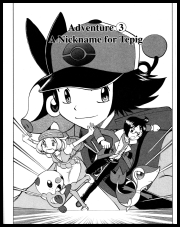 Adventure 3 - "A Nickname for Tepig"
At a nearby library, Black tells his Pokabu that he wants to find out what it'll evolve into so he can give it a fitting nickname. Pokabu gets upset and runs away, so Black chases after it. Back at Araragi-Hakase's house, Cheren and Bel tell the professor about Black's past. 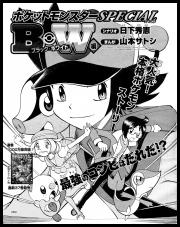 After they finish telling her about how he's dreamed of winning the Pokemon League ever since he was little, they are asked to find Black and tell him to take good care of his Pokemon Zukan since it's the only working model left. Elsewhere, Black has followed his Pokabu into a rocky area. He figures out that Pokabu's upset because it thinks Black naming it after its evolved form is a sign that he doesn't like it the way it is. Suddenly, a wild pokemon attacks! Black, not wanting to hurt Pokabu's pride any further, surreptitiously gives it hints about the identity of its attacker. Before long, Pokabu finds the pokemon and defeats it all by itself. Black congratulates his pokemon and decides to break from tradition and name it after its current form after all. 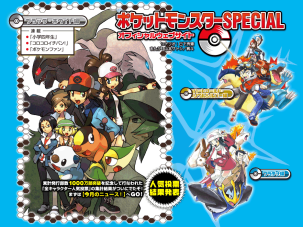 With that settled, Black sets his sights on getting his first Gym Badge in Sanyou City. Page 47, Panel Four: Cheren tells Professor Juniper that "He doesn't have a cell phone" when asked whether or not they've heard from Black. In the Japanese version, he uses the much more open-ended tsuushin shudan (通信手段), or "means of communication." Page 52, Panel Five and Page 53, Panel One: Black's handwriting is made significantly more legible in the English version. He also misspells the word ゆうしょう ("victory"), which is understandable given that he's only five years old during this flashback. On another note, I'm surprised that the preschool Black in the English version was thorough enough to add the little accent over the e there in the word "Pokémon." Page 60, Panel Three: Here, Black says "Are you trying to prove how tough you are? Good for you!" 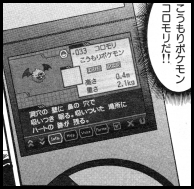 In the Japanese version, he guesses that Pokabu is trying to appeal to its trainer by showing how strong it is even though it hasn't evolved (「進化しなくたって自分は強い！！」ってアピールしてんのか！？). 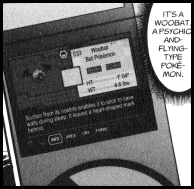 Page 63, Panel Five: When Black looks up Woobat in his PokéDex, he says "It's a Woobat. A Psychic- and- Flying- type Pokémon." Originally, he doesn't mention the pokemon's types. Instead, he says Koumori pokemon Koromori da!! (こうもりポケモンコロモリだ！！), or "It's the bat pokemon Koromori!!" 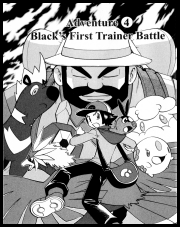 Adventure 4 - "Black's First Trainer Battle"
On Route 1, Black tries to think of the various ways he can train his pokemon. He had always wanted to try a trainer battle but was never able to find an opponent growing up, so he figures he should try sparring with other trainers now that he's out on his own. Before long, a hiker named Natsumi appears before him and challenges him to a triple battle! Black is nervous about his first trainer battle being a three on three match but presses on anyway, taking notes as he goes. When Black orders Poka to use Nitro Charge, Natsumi is unable to withstand the heat and runs away! Without their trainer there to guide them, Natsumi's pokemon quickly fall in battle. After the match, Natsumi tells Black that he wants to give up his dream of entering the Pokemon League because of how pathetic he is at battling. Suddenly, a fire breaks out! After his pokemon extinguish the blaze, Black tells Natsumi that it was caused by his pokemon trying to become stronger for his sake. Now that he's put out the fire and convinced Natsumi not to give up on his dreams, Black heads toward the next city. Unfortunately, I do not own the Japanese version of this chapter at this time.